Japanese bee's small and weak group cannot live if there is no savings of enough honey in winter. It is because the energy of honey is consumed into energy that keeps the nest warm. Then, to pass the small and weak group, the sugar water is given. I made the feeder devising it. When a Japanese bee is bred, the number of egg layings might be little according to the crowd. And, the nest doesn't grow so much. The size of the nest of the crowd that I am breeding is about 20-25cm the diameter, and has not grown at all though passes summer. The number of bees is in extent in which the nest is not seen. I do not think that the number of bees is less than the size of the nest. Then, the sugar water decided to be given. It made it by using tappauea because the structure was easy though there seemed to be a feeder on the market. Tappauea in the hundred-yen store was processed and the feeder for a Japanese bee was made. The one that there is room in the lid of tappauea is necessary. After the thing that warmed sugar and water mixing it with 1:1 in the weight ratio and melted it had been cooled, it put it in this feeder. After a part of the part that became the container of tappauea of the size of 700m Litter level was cut with nippers and it lacked it, the sugar water was put in. After this is made inverted, the toothpick has been inserted in the cutting lack part. After it had processed it to remove the board on the nether side in the back most of the nest box, the feeder was set from the back of the nest box. I fed the other day as for 400g, and it disappeared one week later. It is about 500g this time. The bee came immediately to check when setting it. This made the feeder for a Japanese bee by using two kinds of tappauea. The container that becomes up as understood in this photograph is tappauea of 320mL. 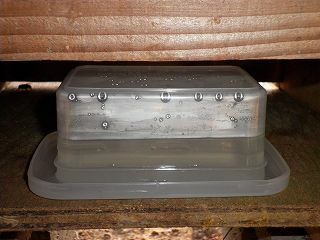 The lid that becomes it below is tappauea of 380mL that is one size larger than it. The edge of the container that becomes it up is cut with nippers by about 3mm in depth and it lacks it. The purpose of this is to turn on the sugar water to about 3mm in depth. It covers with this lid after the sugar water is incased. And, the top and bottom is made inverse at a dash. There is no problem though about several drops spill. The sugar water comes out from the container automatically when the bee absorbs the sugar water. 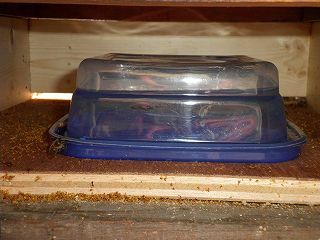 After the sugar water is often put in the container like the plate, it seems to set it up in the nest box when there is no special feeder. When it is this method, the bee is often drowned in the sugar water. Therefore, the method of floating splittable wooden chopsticks seems to be adopted. Moreover, a lot of garbage on the nest box enters the plate because the saucer broadens as for this method.